Gov. Deval Patrick has made our summer —before it even began officially. 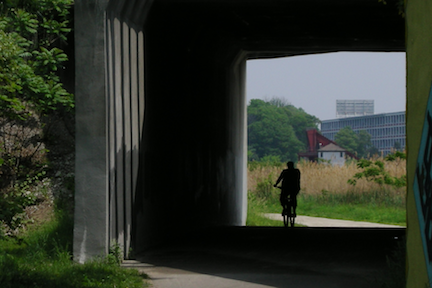 On June 11, the Patrick administration announced that it intends to fully fund the completion of the Neponset Greenway, a long deferred project that has been stymied — despite clear public support — due to the lack of a clear funding pipeline. “Investing in healthy, alternative modes of transportation will benefit residents today, and leave a lasting impact on the Neponset River Greenway Corridor for generations to come,” said Patrick in a statement that pledged to get the missing links completed over the next three years. The statement included a mention of new funding — totaling $1.9 million — in this year’s budget to finish design work on the project. The total cost of the Greenway extension will likely be between $11 and $14 million, officials say — and it will be paid for through the state’s Department of Transportation. The funding breakthrough came as a surprise even to long-time advocates of the Greenway, some of whom were girding themselves for another game of chance in seeking federal TIGER grant funds to complete the job. After two unsuccessful bites at the highly competitive federal grant apple, however, state officials were pessimistic about their chances. Patrick, a Milton resident who is himself an occasional Greenway walker, knows first-hand the impact that this amenity has had in Dorchester. He also is aware that his neighbors on both sides of the Neponset have labored for years now to come up with a compromise route through Mattapan and Milton that will allow for the path’s extension. That route will include a new bridge over the Neponset and a flyover near Mattapan T station to bypass the trolley tracks— since T officials won’t allow any new grade crossings along the tracks. The other key element that the project will advance is a new connection between the existing Greenway in Port Norfolk and the Harborwalk in Columbia Point. Critically, engineers want to build a boardwalk through an easement next to the landmark “rainbow” tank property owned by National Grid. This passage will make the Greenway safer by allowing users to bypass a dangerous expressway off-ramp at Morrissey Boulevard. Such an improvement will make this a more viable seasonal route for bicycle commuters — who will one day be able to use the Greenway as a daily coastal route to and from town. The Neponset Greenway will be billed as an important alternative transit project— and it’s certainly that. Patrick officials estimate that the number of Greenway users— currently estimated at more than 10,000 people each day— will double once the missing links are fixed. But longtime observers of our neighborhoods’ waterfront understand that it’s completion will be far more significant. After years of being shut off from our river and bay by filthy industrial uses, railroad tracks, and barbed-wire fences, city neighbors and their allies in the environmental movement have made steady progress in reclaiming our natural resources in this part of the city. The completion of the Neponset Greenway will be a historic achievement in the struggle to re-connect our city communities to the waterfront that attracted settlers here in the first place. We applaud the governor and his team for embracing this important project. It will be serve as a lasting legacy to his commitment to our neighborhoods long after he has left the State House.